U.S. Army recruiters are cancelling contracts for hundreds of recruits born outside the U.S., leaving many vulnerable to deportation or forced to apply for asylum, per a Washington Post report. What's happening: "Layered security checks" of these recruits can add a significant amount of time to the enlistment process, sometimes even years. The military said these lengthy processes "frustrate recruiters who must meet strictly enforced goals." 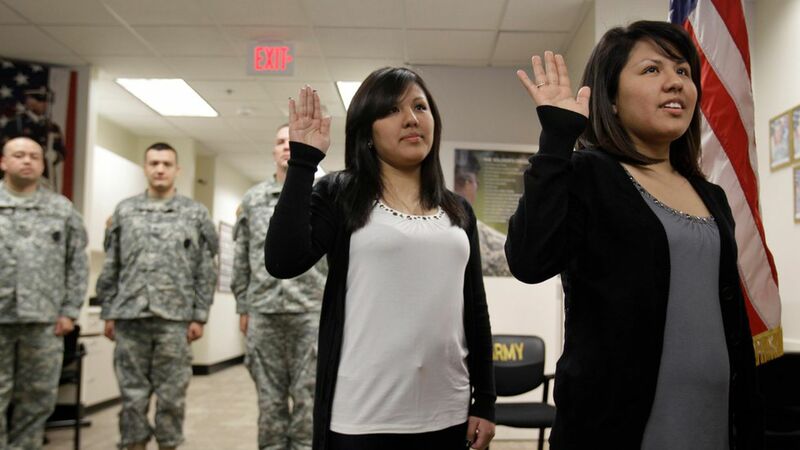 Why it matters: If in the time of processing their enlistment, the recruits' immigration status expires and their contracts are cancelled, they could be subject to deportation. What's next: Democratic senators Kamala Harris and Richard Durbin filed a defense authorization bill amendment to allow recruits to stay in the U.S. until their background checks are finished. Sen. Harris tweeted: "These brave men & women enlisted & the Administration turns its back on them."